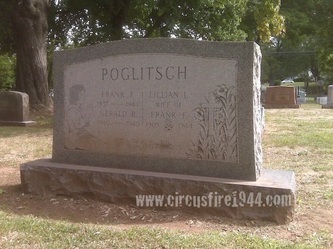 Mrs. Lillian Lina (Roth) Poglitsch of 311 Shuttle Meadow Avenue, New Britain, was born June 30, 1908 in Passaic, New Jersey, daughter of Hungarian born parents Hannah (Moskowitz) and Joseph Roth. She was found dead at the circus grounds after the fire on July 6 and was buried at Fairview Cemetery in New Britain after services at the A.W. Carlson Funeral Home. Mrs. Poglitsch leaves her parents, Hannah and Joseph Roth, a pharmacist at Roth's Pharmacy in Passaic, New Jersey; her brother Edward and sister Daisy; and her husband, Dr. Frank F. Poglitsch. Their son, Frank, Jr., 6, was also a victim of the fire, and the couple had previously lost an infant son Gerald in 1940. On July 8, 1956, New Britain osteopathologist Dr. Frank Poglitsch would again suffer the loss of a child, his seven-year-old daughter from his second marriage, Elaine, died at home from an illness. Body #2113 was identified at the State Armory as Lillian Poglitsch by her husband, Dr. Frank Poglitsch on July 6. Lillian was a college graduate and a registered nurse, and could speak several languages fluently. Her estate was awarded $11,500 by the arbitration board.